Introduced in September 2012. Located in the Abdon telephone box. Borrow a book and leave a book, or sit and relax and simply read a book. 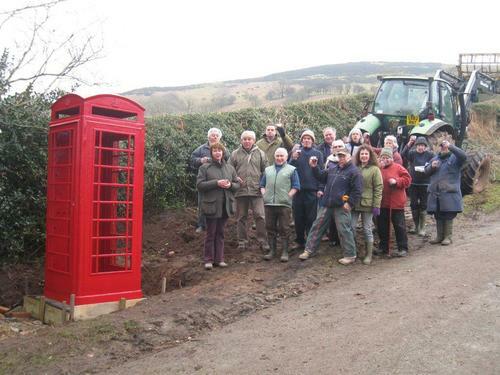 On Sunday 17th April 2011 the Abdon community gathered to celebrate the return of the red telephone box to Abdon. The launch of the new telephone box followed a two year fundraising campaign by the community, after the previous telephone box was removed by BT to the dismay of residents. The community purchased, installed and painted the new telephone box themselves, which is now used as a community book stop. "We are thrilled to have our heritage and our landmark back". A meal to celebrate the new telephone box, and to thank the Swan Inn at Knowlesands for their contribution to our campaign, was held on 15th June 2011. Thank you to Dora who created this kneeler for the church commemorating the return of our red telephone box. Photographs of the installation, launch and celebration meal.